Recently, Airwheel unveiled its two-wheeled self-balancing bike Z5 in the 2016 CeBIT Hannover for the first time. And then Airwheel displayed it in Global Source Electronics that was held in Hong Kong. Days ago, it made its appearance in Canton held in Guangzhou once again. 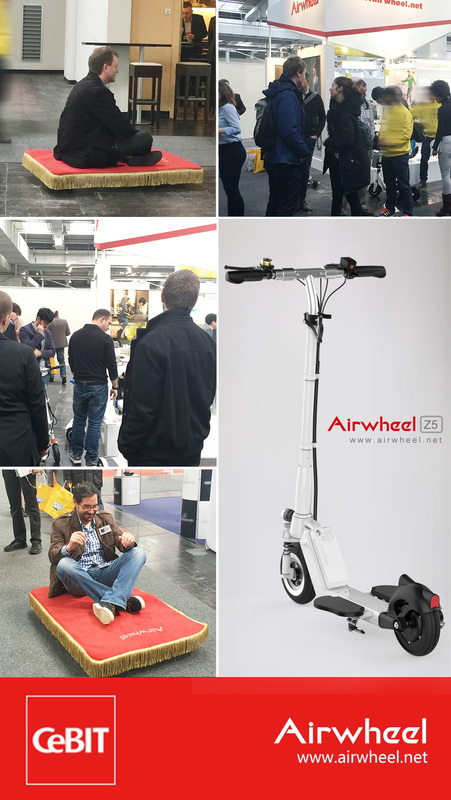 Through the appearance in the three large international show trade, Airwheel Z5 became more and more popular with numerous people across globe. Airwheel two-wheeled intelligent bike Z5 indeed offers a lot of convenience to people, notably white-collars. Firstly, Airwheel Z5 is small in size. Airwheel Z5 weighs merely 14.5 kg so that even a child can lift it by either of hands. What’s more, it can pack away to enter into the boot. For many white-collar, they have to change several times. They could ride Airwheel Z5 and before change to the bus or underground, they fold Airwheel Z5 so as to bring it into these transportation. In the office build, most of rooms are small. The user can fold Airwheel Z5 under his office desk. It will in no way stand in way of other colleagues.